My time with the Yamaha MT-09 Tracer has come to an end and I’m already missing it. The term ‘all-rounder’ can often paint a picture of a bland bike that’s alright at most things but doesn’t master any of them. 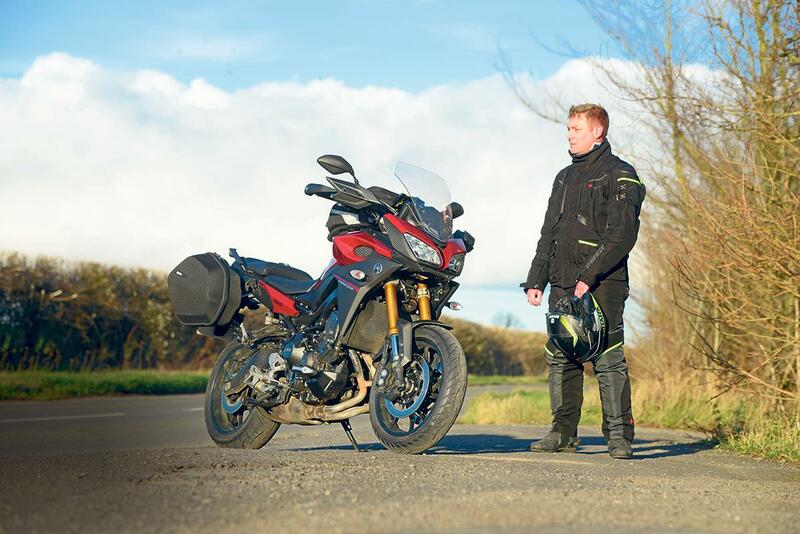 The Tracer is definitely an all-rounder but it’s not dull — in many regards it’s nearly perfect for most people, most of the time. After the time I spent with the bike I think I can explain my argument. For a start it’s reasonably priced at £8149. Sign up for PCP and you’ll need to find £2000 as a deposit and then £109 a month for three years, with a £4000 optional payment at the end of the term if you want to keep the bike. That’s great value for a bike that impresses as a daily commuter, weekend fun machine or two-up tourer. Its 847cc three-cylinder engine produces a sprightly 115bhp, which combines with the relatively light 210kg kerb weight to make a genuinely quick bike. The triple sounds good, has a lovely smooth throttle and just enough electronics in the form of ABS, traction control and rider modes, without adding unnecessary complication or cost. It looks good, handles well (more on that in a minute), stops well and the optional Yamaha heated grips (£144.99) are the best I’ve ever used. In my time with the bike, fuel consumption averaged 48mpg and the range could easily hit 200 miles on steady rides. The seat was comfortable, the standard adjustable screen was not the best but good enough (though it does bounce around a fair bit in the breeze), and it looks good too. Build quality has been top-notch, and the bike sailed through winter completely corrosion free. There are two niggles that I addressed fairly quickly, easily and without spending a fortune. The first was ditching the standard Dunlop D222 tyres. Quite simply, they weren’t good enough and the brittle and harsh ride they gave undermined my confidence in the handling. I tested a variety of alternatives, all of which were far better than the OE rubber (see below). I tried to get the standard suspension working for me before changing any parts, and the experts at MCT Suspension in Stowmarket did a £115 set-up of the stock stuff, which improved matters. But then they went further with a £288 option involving new linear fork springs, thicker oil and different spacers, which transformed the bike and remains the best modification I made throughout the year. Details of the set-up for the standard suspension, and information about the MCT modifications can be found here. Looking back, my favourite moment with the Tracer was sitting up for a late-night beer on a Scottish campsite in the Galloway Forest Park so I could watch the night sky. It wasn’t the perfect time of year for stargazing but it was still a fantastic way to spend a weekend and the ride there and back was brilliant fun. In contrast, embedding myself in the side of a car that failed to stop when it was joining a roundabout, flying across the bonnet, breaking my foot and wearing a hole in the side of the engine was slightly less fantastic. Damage to the bike was nowhere near as bad as I thought it might be, with a holed radiator the biggest expense at £250. The handguards saved my hands from injury and the standard ABS brakes did a brilliant job of slowing me down while letting me keep control, but they couldn’t change the laws of physics and stop me in time. The car driver was prosecuted by the police and I wasn’t able to ride for four weeks while the broken bone healed. There are more expensive bikes than the Yamaha Tracer, there are more technically advanced bikes, there are faster, bigger, more powerful bikes. But the Tracer can do pretty much all of the things they do, but keeps it simple, keeps it fun and best of all, keeps costs to a manageable level.